After graduating from the Great Lakes Culinary Institute and working in three of Traverse City’s top restaurants, chef Susan Patterson knew her way around a kitchen. But the one she picked to launch her career doesn’t have any ovens, traditional stoves or microwave. In fact there’s only one heat source at Press On Juice – a single induction burner where Patterson concocts soups and quinoa. They’re virtually the only cooked items on the menu at the 95-percent raw food establishment, unique in Traverse City’s ever-expanding restaurant scene. 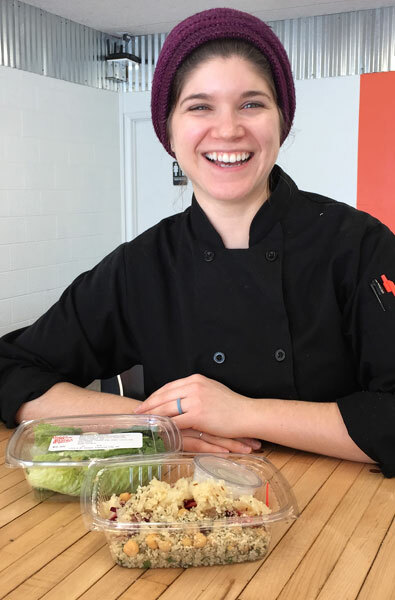 Owner Kris Rockwood said Patterson, 24, has played a key role in helping Press On flourish in that niche, taking the business from primarily a take-out juice and smoothie operation to a full-fledged café offering breakfast, lunch, dinner and desserts. The café side of Press On Juice, 1125 E. Eighth St., opened in December and seats about 30. Things like how to make walnut taco meat live up to the expectation of taco lovers. “Raw food is so unique. It needs to be excellent. It needs to be off-the-charts good,” Patterson said. Patterson views the “steep learning curve” as a challenge, however. She did an internship at Press On Juice last summer, and became convinced it was the place to begin her career. She also prides herself on her efficiency. Time management and organization are major factors in keeping any kitchen running smoothly, and it’s even more true at Press On Juice, where Patterson’s imposed a short shelf life for many items in order to keep quality high. “The culinary school really helped me build confidence in my abilities,” Patterson said. She thinks there’s room in the curriculum for one more course, however. “I think it would be fun down the road to see the culinary school offer an extra class on raw food and these techniques,” she said. Press on Juice juices are also expected to be on the menu at Café Lobdell’s when it opens June 18 as a morning bakery/café operation.